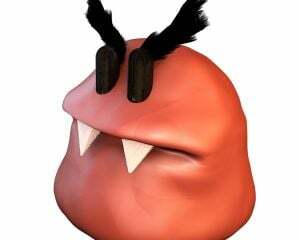 Surely some or hopefully all of you have seen the trailers for the upcoming Wreck-it-Ralph (coming soon to a theater near you!). I guess I probably saw it as a trailer for Paranorman (which was pretty good). But man, this looked pretty keen. One of these fancy new CG animated movies all about video games? Ooh, I recognize that guy! And that guy! And those guys! And at that point my brain probably melted. It looked good, but I didn't recognize the main characters from anywhere. That might be because their game doesn't, er, exist. AT LEAST, NOT UNTIL NOW. As I was walking into work the other day, I saw a big promotional banner for the movie in the cafeteria. I thought that was kinda neat. 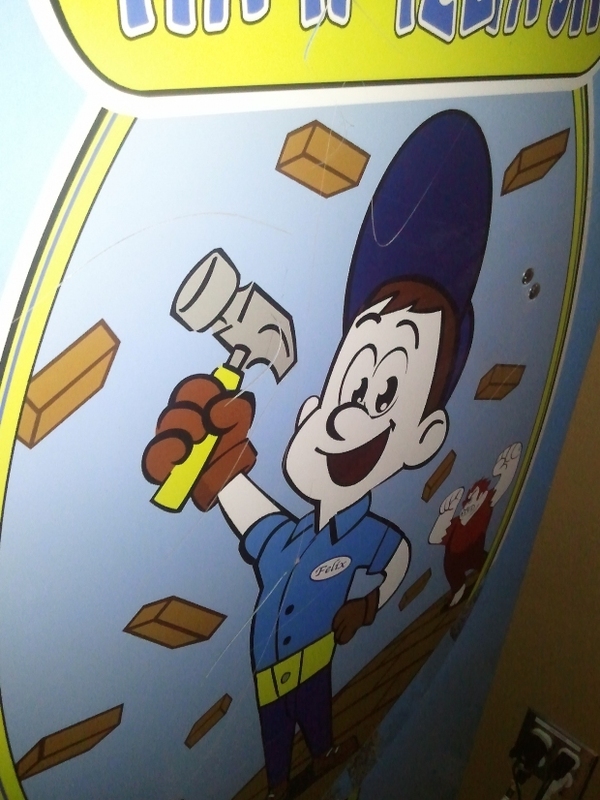 Then, next to the two pinball machines, I saw an unfamiliar cabinet. Let's have a closer look, shall we? 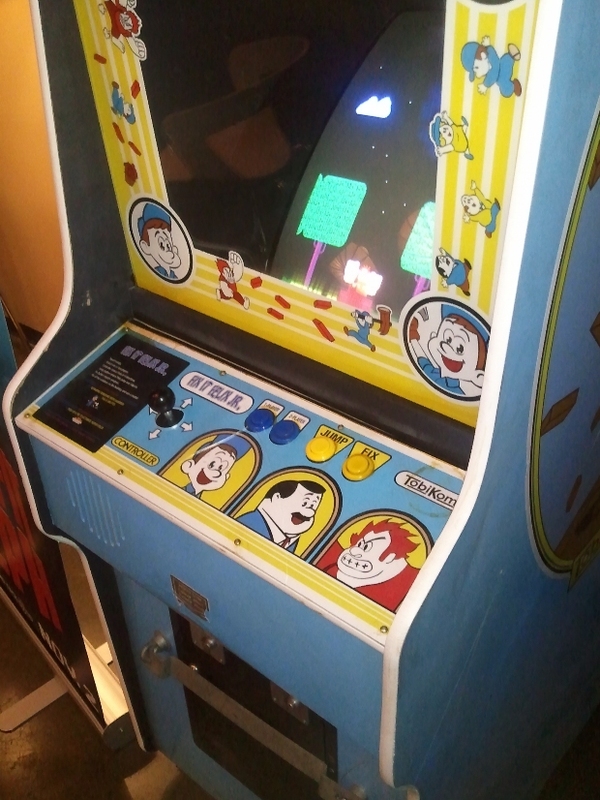 So Disney and someone or another created an actual video game as promotion for the movie and put it in a real cabinet. I approve. We spent a few minutes playing it today. It was not super deep, but kinda fun. It really hits the nostalgia nail with the old school hammer. What does that even mean? Gameplay-wise, it's pretty simplistic, and gives kind of a Donkey Kong vibe. At the beginning of each round, Ralph breaks a bunch of windows on a building. 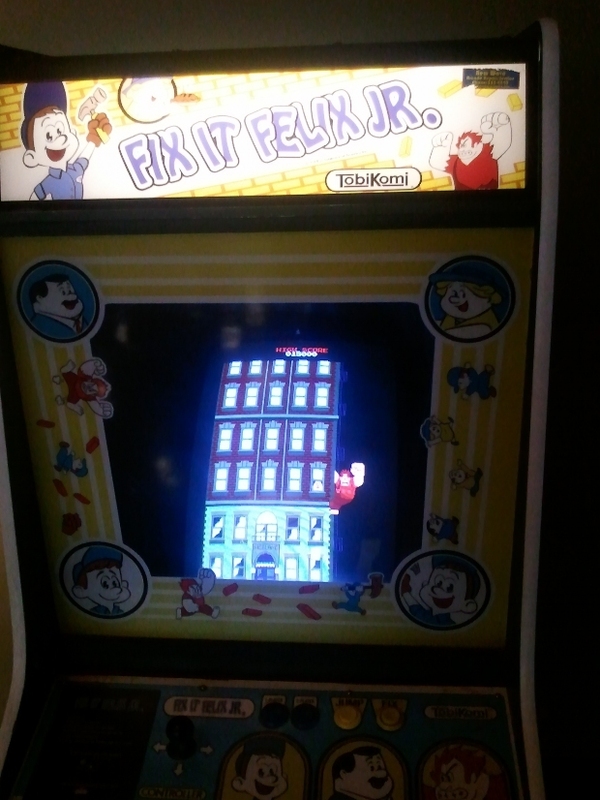 As Felix, you then hop between the windows and repair each one with a button press. All the while, Ralph is raining bricks from above, so watch out and don't get hit!!! Here ya go, why not just watch this thing I recorded? It's actually 2-player, too, where you pass back and forth. Neat stuff. Sorry for the video quality; the lighting in that part of the cafe is awful. The coolest part about the cabinet, though, is how they made it look old and authentic. I've tried to snap a few close up shots that let you see the damage it's undergone. There are what look like coffee stains on the part near the joystick (I didn't taste to confirm, sorry). 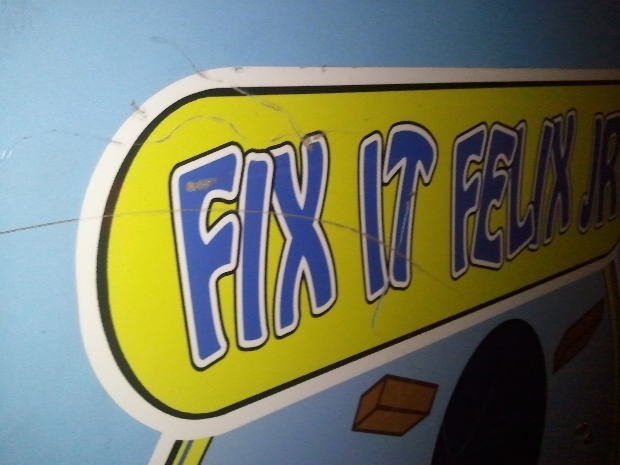 The same panel's plastic is cracked. There are score marks on the side. The glass is not super clean (nor is it nasty). All in all, the machine just looks, well, used. We thought that maybe they just bought an old cabinet, painted it, added the logos, and put it out there, so it carried the scars from its long and storied history, but some of the scuff marks and stuff look like they were done after the cabinet was decorated with labels. 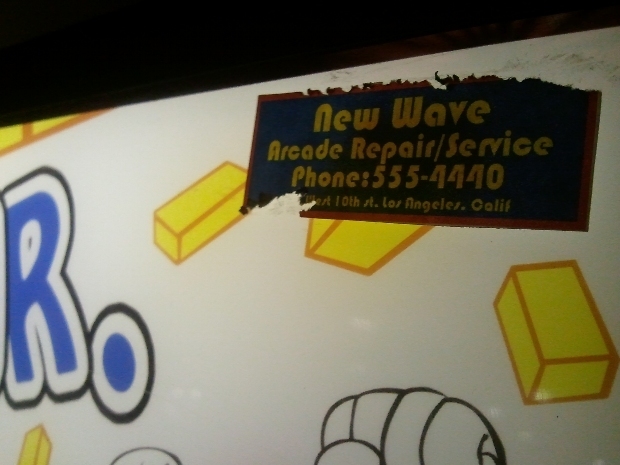 Heck, there's even a half scratched-off label that tells whom to call for repairs. I really do think they took the time to make it look old and used. Somehow that is more interesting to me than the thing's existence, itself. This was a cool little piece of advertising to see. I wish this sort of thing happened more often, yanno? Moral of the story: video games are awesome.